Stucco is a finish masonry product used on interior and exterior walls. There are a variety of application procedures, including creating textures by spraying the final coat on the surface for a uniform sandy texture or with the use of trowels for a 3-D effect. Skip troweling leaves the surface with a deeply textured pattern and is achieved with a trowel. 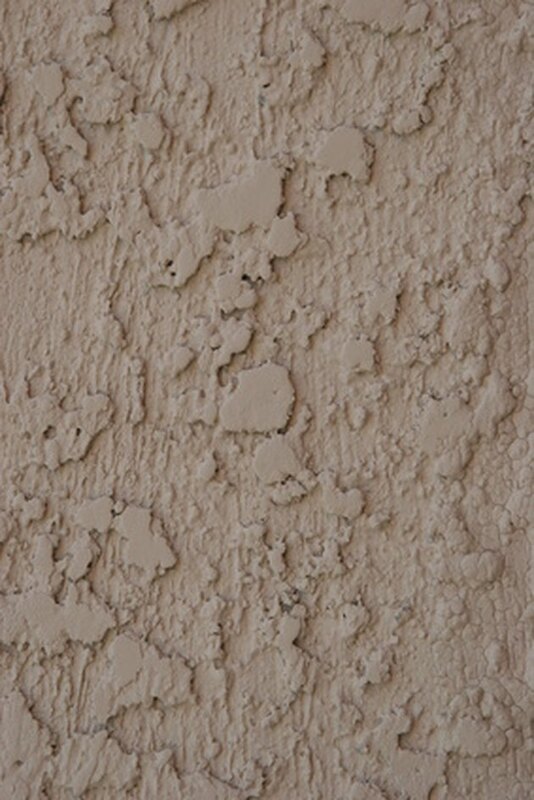 Make sure the surface is clean and dry before applying stucco for the best adherence of the finish. Get a skip troweled finish with two layers of stucco. Mix stucco according to package directions in a bucket. Use a small stainless steel trowel to mix the stucco thoroughly. Apply a 1/8 inch layer of stucco mix to the surface with a large stainless steel trowel. Apply in smooth, even wide strokes while holding the trowel at a 10-degree angle. Allow to dry according to drying time printed on package. Mix another batch of stucco according to package directions. However, mix to the consistency of pudding by adding water and mixing thoroughly with a small trowel. Work in sections. Dip a stucco Tampico brush into the wet stucco mix. Splatter onto the wall in a random pattern by flicking the brush toward the wall. Allow the stucco to dry on the wall for about 15 minutes. Smooth the tops of the stucco blobs with a large stainless steel trowel. Feather the stucco blobs with random strokes of the trowel to avoid creating a pattern. Repeat for the next section of wall. Feather each section to the previously done sections.